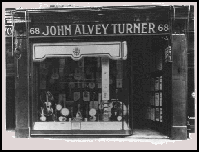 Our website address is: http://johnalveyturner.co.uk. Other than any information you personally choose to provide by using the contact form, we do not collect, or store any data when you visit our pages. Any information you choose to provide via the contact form will be used solely by us to to deal with your enquiry and deleted when and if it is no longer required to meet the purposes of your enquiry. We do not share your data with anyone without your explicit consent and will do so only for the purposes of progressing any services or transactions agreed as a result of your contacting us. Original JAT shop sign from the 50s or 60s - abandoned when the business moved, acquired via eBay in 2010! !